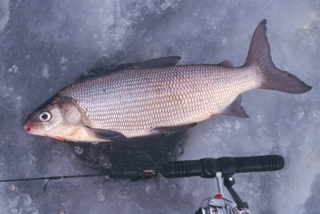 Perhaps the most sought after winter fish, the lake whitefish, has it's own unique appeal due to it's totally different character. Whites don't fight like a rainbow, they don't smack big baits like a pike, they bite in slow motion and rather daintily, if that's even a word. Delicate most appropriately describes their actions, as well as, their snow white flesh. Catching whitefish is all about timing. The consistent bite is in the early morning and this seems to hold true from lake to lake. I have caught whites at all times of the day, but the best fishing has always been at first light. Get on the lake at dark. Drill holes over four to 10 feet of water and plan to be fishing as the light hits the horizon. If the fish are going, a limit of whites will be on the ice within the hour. 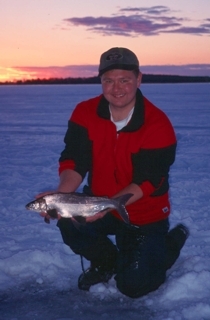 Catching whitefish is all about finesse. Not all whites, but most of the whites I pursue around central Alberta have a preference for small things and light lines. Whites are the most line sensitive critters I've encountered and my recommendation is to get used to running four pound mono line or if you want to use a heavier line tie a thinner tippet at the end. My suggestions would be 4X tippet or 5X which is my preference. See the gang at the Fishin' Hole and they can put you into some good tippet material. Catching whites is all about watching the action. Almost all of my fishing is done in 10 feet or less and I see almost 100 percent of the fish before they strike. Now with whites, the strike is deliberate. Many whites will come in slowly to my wireworm or fly. Some will move right to the hook and bite, others will come in, turn at the last second and make a second, third or even a forth fly by before committing to the strike. When a white is in tight, I have my best luck converting the bite by keeping the hook absolutely still or lifting it ever so slowly at a snail's pace. Any sudden action seems to spook them, so I avoid that at all costs. 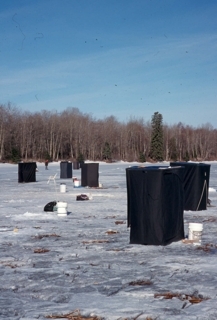 Ice fishing tents are a whitefish angler's best friend as this style of fishing is 100 percent visual. If you don't have a tent, using a little blue foam mat or a tarp to lay on and look down a hole will work. But for comfort and convenience a tent can't be beat. I've heard the whites at Pigeon Lake, Alberta are going hard already and I've been meaning to make a trip to Sylvan Lake, Alberta after seeing so many whites there this past summer. It looks like this winter is building up to be another great whitefish season.